Borrow From Us For A Small Fee. £3 hire per day plus a minimum £25 Refundable Deposit. They can be collected from us, or can be delivered free of charge along with a Cake order but it is the customers responsibility to return it to our base within the agreed time limit and in the same condition as when it left. At Sweet's Treats we have over 100 beautiful, hard to find Trumpet Champagne Flutes for Hire. These are charged at £10 per day for each 50 hired plus a Refundable deposit. Breakages are charged at £2.50 per Glass. All glasses must be returned washed otherwise a cleaning fee will be deducted from your deposit. 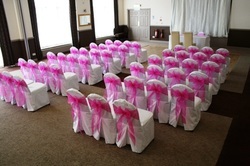 For all your Chair Covers, Table Dressings and Centre Pieces Beautiful pieces at very reasonable prices. Covering London and South East.